We offer a modern studio unit with separate entry, with all the modcons yet with a feeling of a home away from home. We live on a property where we are returning the environment back to native New Zealand bush, but we also enjoy a garden profuse with flowers and edible plants and fruit in summer. Make use of our large garden and the paths leading to quiet areas, read a book on a comfortable lounger by the stream, eat your meals outside on the table and chairs across the stream, wander around watching and listening to the birds. Great opportunities to photograph tuis, bellbirds, waxeyes, kereru; wood pigeons, and occasionally the reclusive NZ falcon. Our ever growing populations of tuis and bellbirds are a constant delight and they will serenade you with their famous birdsong. You are welcome to view our live feed YOU TUBE TUI HOUSE QUEENSTOWN. Wilson Bay is popular in summer for water sports, and all year round for the Wilson Bay walking tracks and mountain biking tracks. Try your luck fishing in the bay or at one of the many hotspots nearby. We live in close proximity to many other walking, hiking, and mountain biking tracks. Grant is a hiker, mountain biker, hunter, fisherman, was a commercial paua diver for 23 years, and is happy to advise you on all the places to explore during your stay. His floor to ceiling topographical map has been well used! Monica is an avid gardener, artist, manages Southern Lakes Info Centre and she will be happy to assist you in any activities you may wish to try during your stay in New Zealand's adventure capital. We share a private driveway with our neighbours and offer off road parking. FREE WIFI, FreeView TV, use of DVDs and our book library. We have a friendly dog but If you aren't keen on animals we are happy to keep her away. Cell coverage can sometimes be a bit patchy if you are on Vodafone, but we are happy for you to use our phone if needed. What'sapp, Skype, Viber all work as an alternative. We loved Monica and Grants place. Not only are they wonderful people, but their place is very unique. It is the perfect retreat from the busy Queenstown. It is like staying in a sanctuary for bird. And just down the road, there is a nice little beach. Monica and Grant are splendid hosts who have carved out a space for themselves and their guests in a beautiful rain forest on the shores of lovely Wilson Bay. While their home and accommodation is not actually on the lake shore, it is only a 3 or 4 minute walk down their picturesque driveway to reach the water. This couple have a passion for birds and so have revived the local bird life in their area by getting rid of "introduced" predators and creating natural looking feeders to nourish the wonderful honey eaters such as the Tui and Bell Bird. We stayed in Tui House on the ground floor of our hosts' home. In a space about the same size as a standard "motel" room in the US, Grant and Monica have managed to develop a self contained "unit" with a tiny kitchenette and eating area. They have even put in a single bed in addition to the Queen sized one. We were blessed with weather good enough that we could get out and explore the area very well. However, if the weather Gods had not smiled on us, and we had to endure the typical rainy weather, we would have felt very cramped staying inside in such a small space. With a bit of rearrangement the space could be made more usable and more comfortable. We agree with the other guest who suggested replacing the single bed with a small futon or convertible sofa to create more floor space and a place to sit. In addition, bringing the tiny fridge off the floor and switching it with the cabinet that is currently above it would make it much easier to access. The cabinet containing dishes could be fitted with drawers that would make them easily accessible even from the floor level. A rethinking of the space taken by all the book shelves could also free up valuable floor space. Still. . . we highly recommend a stay in this wonderful place with those amazing people! Have stayed here multiple times with our dog. 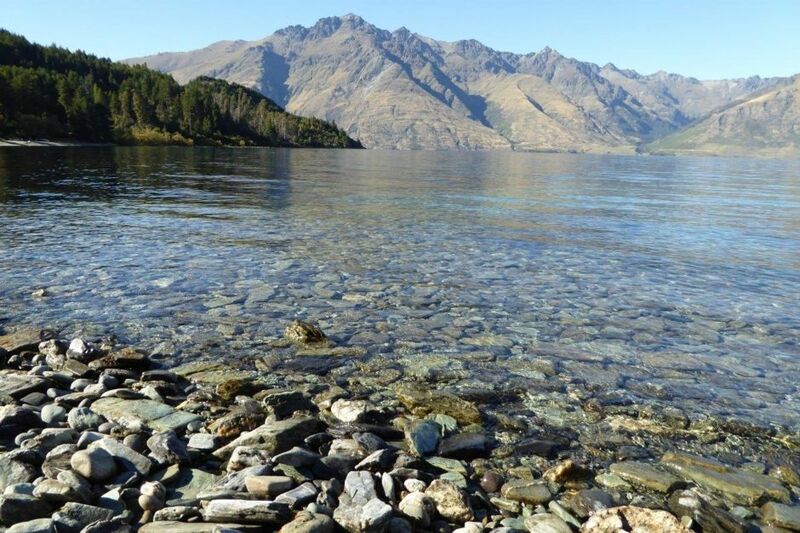 Great location, peaceful but near all the amenities in Queenstown. As usual Monica and Grant were very welcoming and went out of their way to help us when we had car troubles. klein, maar heel mooi gelegen.